1. It is difficult to process and has a long processing cycle. Since it belongs to a deep cavity type mold, if the depth of the entire cavity of the front mold is 180 mm-240 mm in the A plate, the depth is too deep, which is unfavorable for processing, and requires many positions for electroforming, and the processing cycle is long. 2. The size of the A plate is large and the mold material cost is high. Due to the customer's request for the original mold body, it takes a very high height to pack the entire front mold cavity into the A plate. For example, the thickness of the M140537A plate is 450mm, and the thickness of the M140505A plate is also 450mm. 1. The mold base of the same size body product is greatly reduced by the improved structure. 2. The material size of the improved A plate is reduced, the processing cycle is also reduced, and the processing efficiency are improved. This shortens the mold making cycle and wins the recognition and trust of customers. 3. Injection mold making cost is about 22%, according to the price of the material P20H used in the A board (17 RMB / kg, can save material costs about 17224 RMB). 4. The processing cycle can save 8.5%. 5. This improvement has been extended to all baby carriage injection molds. A cabinet machine project home appliance injection molded product is an important appearance part. The product length is about 1.7 m. It is a large-scale product. In order to save mold making cost when making the initial plan, the positive mold is used, which saves mold thickness. But because the product is large, when it is installed, it is not possible to feed the glue at the top, and the gates are filled sideways, resulting in as many as 18 gates. With a positive mold, the gate distribution requires 18 points and the injection pressure is high. ACO Mold precision injection molding manufacturers optimize the structure of household appliance injection molds, and change the molds to flip. Only 9 gates are needed, and the number of gates is saved by half. The cost of gate savings is more than the cost of changing molds. In addition, the injection pressure is reduced by 50 MPa, which is very advantageous for the machine. The mold structure has been improved, the injection molding performance has been optimized, and the cost has been saved by 40,000 RMB. A household appliance precision injection mold adopts the conventional inlay method, which has high processing cost, high material cost and long manufacturing cycle. By improving the arrangement structure, the inner mold adopts integral processing, so that the mold base is compact in structure, the size is greatly reduced by two levels, and the parts are less assembled. After the design is improved, the mold base size of the household appliance injection mold is reduced from 650X650X585mm to 600X500X570mm, the weight is reduced from 1500KG to 1200KG, the mold material cost is reduced by 20%, and the injection mold making cost is saved by 4,000 RMB. The mold parts are reduced, the weight is reduced, and the assembly efficiency is improved. The injection molding machine is also be reduced by 1 level. 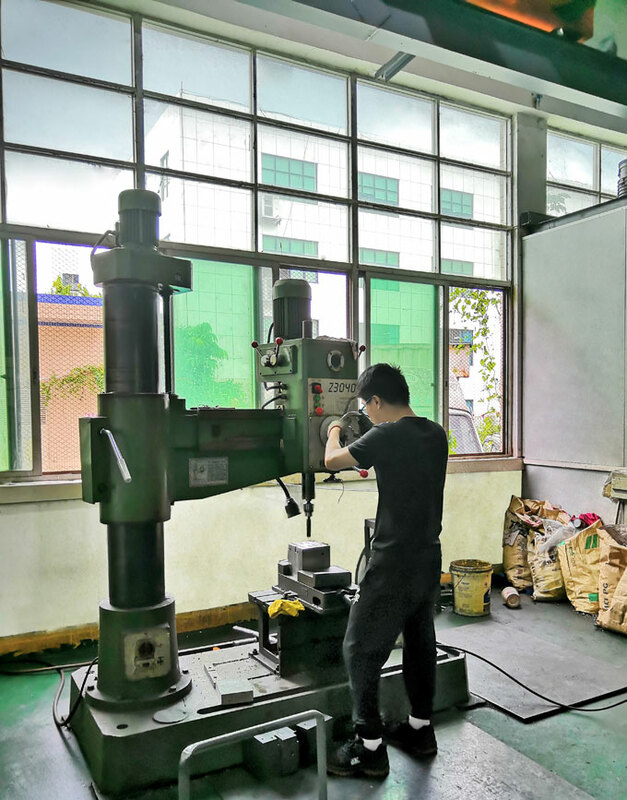 The gate position of the household appliance precision injection mold of a certain air-conditioning project is too deep, and it is difficult to process and the processing efficiency is low, which seriously affects the mold making cycle, and the machining accuracy is not guaranteed. ACO Mold-injection molding company changes the structure of the household appliance injection mold, optimizes the structure and forms the standard. The original structure EDM processing will take 24h, now it only takes 3 hours after the structure change, which greatly improves the work efficiency, reduces the mold making cost, and ensures the processing precision. 2. The overall structure design of the automotive lamp injection mold greatly increases the processing difficulty of the mold, increases the processing risk and increases the processing cost. ACO Mold- precision plastic injection molding manufacturers broke through the traditional mold design, and through the CAE analysis of products and mold, formulated various optimization programs and achieved unexpected results. 1. The B-plate steel material is changed from the original 650mm thickness to 564mm, the material saving is 1460X950X86mm=940KG, and the material cost is directly reduced by about 23,000 RMB. If your product is still in the concept stage, you only need to present your ideas, product features and appearance requirements. Our engineers will give you the best solution, recommend the most suitable materials, and help you take the lead in the market. We are ready and looking forward to cooperate with your next project, Contact Us Now, you will be satisfied to choose us as your partner in injection mould manufacturing injection moulding processing.